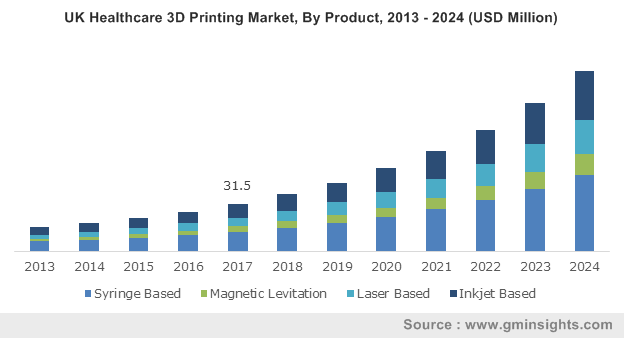 Healthcare 3D printing Market Pdf « Global Market Insights, Inc.
Once thought of as a sci-fi notion, 3D printing has now penetrated myriad sectors, healthcare 3D printing market bearing no exception. Speculated as one of the most disruptive technologies of recent times, 3D printing, with its highly advanced technology, involves the build-up of solid 3D objects from a digital prototype, assembling consecutive material layers on top of one another, that eventually gives rise to the completed object. The technology has been touted by industry gurus as one of the most revolutionary ones in the last few years, given its extensive proliferation in the manufacturing, automotive, construction, chemicals, food & beverage, and medical sectors. The application of 3D printing in healthcare market heavily leans toward prosthetics, customized implants, & bioprinting. In 2015, a team of doctors at the Bengaluru-based Sakra World Hospital performed India’s supposedly first endoscopic surgery on a 5-month old girl with fused skull bones, with a 3D-printed helmet that exerts pressure on the required parts of the skull. The party behind this marvel had been Osteo3D, a phenomenal upstart in healthcare 3D printing industry, that had designed a personalized helmet for the surgery. Today, this tenderfoot in healthcare 3D printing market designs 3D-printed prototypes for surgeries, dental implants, maxillofacial surgeries, and neurosurgeries, and has contributed its models for more than 350 surgeries so far. Recognizing the need for high-grade 3D printing in healthcare industry, the National University of Singapore Centre for Additive Manufacturing plans to develop, enhance, and deploy 3D printing technology in the medical sector, with reference to which the institute has launched a new knowledge center worth USD 18 million. The highlighting factor in this agreement is that four major conglomerates – Osteopore International, Creatz3D, Forefront Additive Manufacturing, and Dou Yee Enterprises have signed MoUs with the center. This is indicative of the robust penetration of 3D printing in healthcare market across various geographies. As recently reported by the Dubai Health Authority, a 60-year old woman from Oman suffering from cerebral aneurysm underwent a complicated surgery that was met with unexpected success, which can be solely credited to the creation of the 3D model of the patient’s brain. The complexity of the patient’s condition prompted the doctors to create a state-of-the-art 3D prototype of her brain dilated arteries that allowed them to understand how to plan the surgery using the safest, low-risk approach. Touted as one of most brilliantly articulated approaches for complex surgeries, 3D printing will transform the perspective of doctors toward operations, which will tantamount to an upswing in healthcare 3D printing market share. Aspect Biosystems, a Canada-based biotech firm has recently declared a partnership with DePuy Synthes Products Inc., with an aim to reinvent the growth curve of 3D bioprinting and by extension, effectuate developments in healthcare 3D printing industry. Facilitated by Johnson & Johnson, this agreement states that Aspect’s massive 3D bioprinting platform will be used to develop a 3D-printed knee meniscus for surgical therapy, that will act as a cushion between the shinbone and the thighbone. Considering the ever-growing pool of elderly patients suffering from osteoporosis, surgical treatment of a torn meniscus via 3D printing will garner positive acclaim worldwide, leading to the widespread commercialization of 3D printing in healthcare market. Shrewdly leveraging on the profitability quotient of 3D printing in healthcare industry, Italy-based OXYDO has collaborated with Materialise NV and the Safilo Group to manufacture 3D printed eclectic eyewear brands. Marking the preface of a revolutionary trend in both, healthcare 3D printing industry and eyewear market, OXYDO proudly showcased its eyewear collection recently, depicting frames using less material. OXYDO’s eyewear range combines the classic frame styles with modern silhouettes by means of 3D printing, setting a precedent for other healthcare 3D printing market giants to follow. Numerous other innovations prevalent across healthcare 3D orienting market include the creation of 3D-printed skin, 3D-printed ears, as recently developed in Scotland for Microtia-affected kids, and even 3D-printed hearts, liver, and other vital organs. While the scenario looks very promising, it does have its share of flaws, given that every patient has a distinguished genetic system. Several questions regarding the credibility and conformity of this technique have been raised by consumers and experts alike. The deployment of 3D printing in healthcare market, for most parts, is still in the experimental stages, while for many other sub-verticals, the technology has already been implemented, and has met with transcendent success. Some of the essential factors that may have a profound consequence on healthcare 3D printing market are the type of materials used for 3D printing, the cost of printers, and the convenience factor of the methodology used for implementing the software. Despite having depicted a commendable success rate in many vital application arenas, healthcare 3D printing market has not yet gone mainstream. However, analysts have forecast global 3D expenditure to surpass USD 28 billion by 2020, a major chunk of which will be procured by the medical sector. All in all, the potential for 3D printing continues to remain colossal, and expert consensus specifically gestures toward the notion that healthcare 3D printing market, slated to cross USD 2.2 billion by 2024, will bring about a conspicuous revolution across the medical fraternity in the many years to come. This entry was posted in Healthcare & Medical Devices and tagged 3d printing healthcare companies, 3d printing in medical applications market, 3d printing in the medical industry, 3D Printing Medical Devices Industry, 3D Printing Medical Devices Market, 3D Printing Medical Devices Market Analysis, 3D Printing Medical Devices Market Growth, 3D Printing Medical Devices Market Outlook, 3D Printing Medical Devices Market Pdf, 3D Printing Medical Devices Market Price, 3D Printing Medical Devices Market Report, 3D Printing Medical Devices Market Share, 3D Printing Medical Devices Market Size, 3D Printing Medical Devices Market Trends, dental 3d printer market, future of 3d printing in healthcare, Healthcare 3D printing Industry, Healthcare 3D printing Market, Healthcare 3D printing Market Analysis, Healthcare 3D printing Market Growth, Healthcare 3D printing Market Outlook, Healthcare 3D printing Market Pdf, Healthcare 3D printing Market Price, Healthcare 3D printing Market Report, Healthcare 3D printing Market Share, Healthcare 3D printing Market Size, Healthcare 3D printing Market Trends, Medical device 3D printing market.